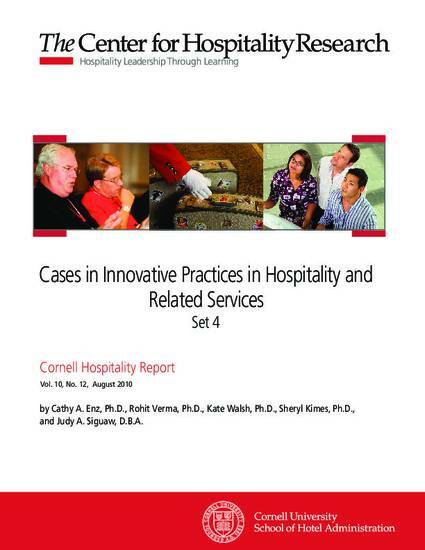 "Cases in Innovative Practices in Hospitality and Related Services: Set 4" by Cathy A. Enz, Ph.D. This final set of hospitality innovators presents vignettes and brief descriptions of some 23 innovations. While the innovation does not have to be the first or best, in many cases the practices described are either unique or most fully realized. The innovators are grouped by the nature of the innovation, including product originality, interior design, unusual staffing or marketing approach, technology enabled, and human resources. The concepts are as follows (in order of presentation): Ubuntu, L’Ouest Express, Founding Fathers, POSH “Improvisational Cuisine,” Praq, CitizenM, Qbic, Pixel Hotel, Restaurant Freud, Hotel Restaurant Abrona, Dans Le Noir?, Heart Attack Grill, re:vive, MiWorld, Hilton Garden “Ultimate Team Play,” InterContinental TweetMyJOBS, Chick-fil-A Innovation Laboratory, Shangri-La Advanced Hospitality Program, Wendy’s International web-based training platform, W Hotels’ “employee celebrities,” Marriott International’ Diversity Ownership Program, Southwest Airlines’ citizenship program, Wyndham Hotels “Women on Their Way,” and the “alumni” programs of Harrah’s, Microsoft, Deloitte, and Bain & Company. Enz, C. A., Verma, R., Walsh, K., Kimes, S. E., & Siguaw, J. (2010). Cases in innovative practices in hospitality and related services: Set 4 [Electronic article]. Cornell Hospitality Report, 10(12), 6-15.